100:133 is for 2400MHz as well, which you can easily see for yourself. Give some benchmark scores. Still waiting for $$$ to sidegrade from my DC i7 to Broadwell to go past 38 GB/s, cause my DC holds my RAM back. tRAS is @ 14 on the screenshot, but I assure you that there is no difference at all between 14 and 18. Last edited by Groove2013; 02-27-2019 at 06:06 AM. Finally got the RAM stable enough to pass Firestrike and gained 200 points from my 2000MHz result. I am happy with that. Had to bump DRAM voltage from 1.65v to 1.675v and I am about 95% sure that did it. Edit: So to show you how jank my motherboard is I had to cheat it into letting me apply 1.675v, before hand if I applied that and saved it would just hang before rebooting and posting (as this board normally does when you put something in it doesn't like). How I did that was changed the ratio back to Auto and selecting 1333MHz RAM, did all voltage changes that needed to be done, applied and restarted. Once it POSTs I go back into BIOS and set it back to 100:133 and 2400MHz, apply, reboot and it posts just fine. That's how jank my BIOS are for those that were wondering, I literally have to do that every time I want to change a voltage (any voltage, even if its not related to RAM, also clock speeds too) otherwise it fails to POST and no there is no way around it. As long as it works I don't really care how many hoops I gotta jump through. Last edited by TwilightRavens; 02-28-2019 at 10:42 PM. Now it's time to lower SA, IO and VDIMM from auto. Last edited by Groove2013; 03-06-2019 at 04:40 AM. Here is link giving technical data, Branch Prefetch/Hardware Prefetch, and Adjacent-Cache Line Prefetch mechanisms help achieve info/data that is not truly representative of actual RAM bandwidth. Mainstream platform is constantly bottlenecked by these or aided when RAM speeds supercede 1600mhz for 133 RAM bus or 1800 for 100 RAM bus. 1600/133 is like 14.5Gb/s, while 1800/100 is like 18Gb/s. BTW 1800 is max officially supported, however the only way to see this is w/ Aida64 on CPU stats, if I can recall. It will give a rundown and that is on the list. 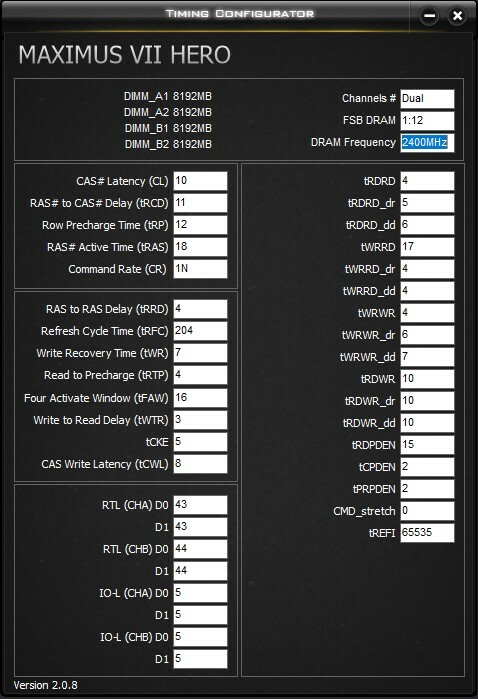 The 22nm memory controller does handle faster memory speeds better than Broadwell's 14nm. I would doubt any quicker bandwidth could be able to achieved unless utilizing Broadwell advanced prefetching along w/ the L4 cache. All of the before mentioned is also no more than a bottleneck at max thoroughput and will generally provide cache misses and the like, which results in unreliable processing of code/instructions in a multi-threaded workload that is strained/stressed. For all the above a workload less than 80% on the CPU is optimal. 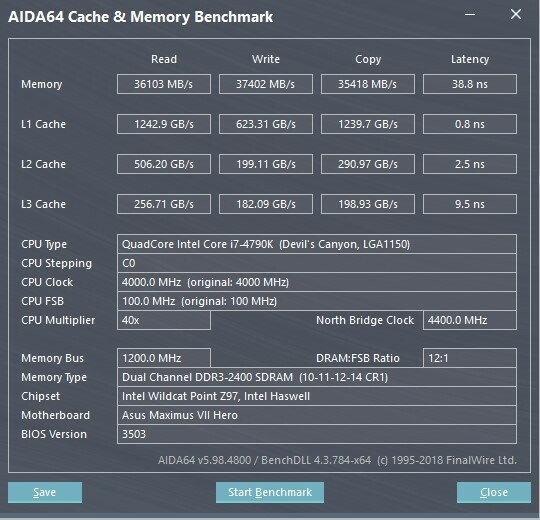 Once again because of the L4 cache, Broadwell is more consistent at over 80%. This is mainly due to lower latency and by-passing the memory controller bus which is the main bottleneck for all referenced scenario. Remember sudden burst of data that hit the memory bus bandwidth wall will corrupt the flow of data and result in threaded workloads waiting for data transfer misses, etc. Which leads to undesirable performance. I will provide a link to a prior post that I gave retrospect to all results, and respective achievements given the limitations of the platform. Last edited by BlownGUNSLINGER; 03-13-2019 at 01:53 PM. Tried very hard to get it [email protected] but it's just not stable... Was regularly BSODing under AVX (R6 siege) at [email protected], 1.35v crashed while browsing after 2 days... Got it second hand, supposedly not overclocked, but I find it hard to believe the chip is that bad from the factory. I'd stay at 1.31V and 4.1GHz, my 5775c can OC to 4.3GHz at that voltage, but I prefer <1.3V anyway, so I settled for [email protected] And, yeah, chip can be "that bad", actually what you have is 80%+ of chips, my 1st sample of 5775c was stable [email protected] or [email protected] just like yours, but I managed to find the sample I have now for a reasonable price so switch cost me ~$15. And I only know of 2 chips(saw actual post by owners) that can do +100mhz at same or less Vcore as mine. Yeah the bins for them are all over the place, mine can do 4.0 at stock voltage, whereas i had a few that took 1.2v at 4.0. I’d say 1.25v or so is above average for 4.2GHz and 1.35v for 4.2GHz is below average. Most will top out at 4.3, some 4.4 and very few 4.5. The bottom barrel chips will top out at 4.2, though to be honest half of it is motherboard dependent, really cheap boards with 0 quality will probably net you 4.1-4.2. Whereas half decent to high end boards will probably get you to 4.3 and higher. Last edited by TwilightRavens; 03-21-2019 at 09:32 AM.